In the summer of 1909, 20 million people visited Coney Island, including Sigmund Freud, who reportedly said that it was the only thing about America that interested him. In 1920, the subway reached Coney (an express train from Times Square took 45 minutes), bringing immigrants and factory workers. The beach was often so crowded that the mass of bodies obscured the sand. Subway fare, a hot dog at Nathan Hand?werker's stand (today, Nathan's Famous), admission to sideshows—each cost five cents. Coney Island earned a new moniker: the Nickel Empire. Robert Moses emerged as Coney Island's most influential critic in the 1930s. But Moses alone wasn't responsible for Coney's decline. The rise of television, air-conditioning, and Disneyland; crime and urban blight; politicians and real estate developers—all played a part. In the 1970s, word spread that casinos were coming to Coney Island, leading to frenzied speculation. Many landowners sat on vacant lots and waited for a big payday that never came. 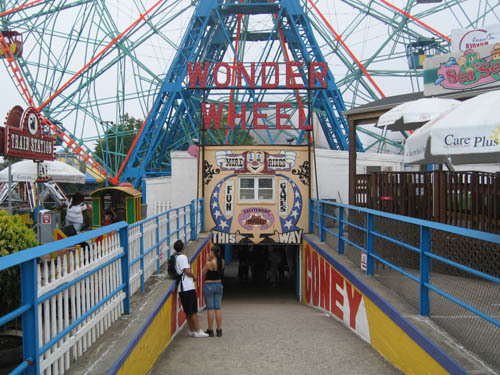 In 2001, talk of a Coney Island revival again gathered momentum when Mayor Rudolph Giuliani oversaw the construction, near the Parachute Jump, of KeySpan Park, a minor-league baseball stadium. Many locals were heartened in August 2005, when Bloomberg saved the Bishoff & Brienstein Carousell, the last remaining hand-carved carousel in Coney Island. It was in danger of being auctioned off; the city bought it for $1.8 million. That the carousel is being restored and will reopen under the Parachute Jump suggests that Bloomberg and the city council are sensitive to Coney's heritage. But precedent has shown what can happen when a real estate developer decides to use heavy-handed tactics against the city. Many years ago, Fred Trump (Donald's father) bought Steeplechase Park, the last of Coney's original amusement parks, and pressured the city to change the zoning so that he could build high-rise apartment buildings. Steeplechase's main attraction was the Pavilion of Fun—a five-acre steel-and-glass building. "It was one of the most beautiful structures in New York," says Charles Denson. "Trump tore it down, and he did it in such a spiteful way. He invited the press and handed out bricks, had people fling bricks through the glass facade." The date was September 21, 1966; Denson was 12 years old. Trump was fearful the pavilion might become a landmark and had hoped that the city, faced with a vacant lot, would cave to his zoning request. It never did. The site is now home to KeySpan Park. Forty years later, the Trump story still sticks in the throat.